Ruth Zavitz is a classic example of a determined author. Flight to the Frontier's birthing process was long and arduous. The story of a family's flight to the wilds of Niagara to escape persecution during the American Revolution was thirty years in gestation. She never gave up. Ruth's historical novel, Flight to the Frontier, is a boon to readers. "The novel has taken that long to find a publisher," Ruth said. "However it only needed one, and they are so enthusiastic they are considering publishing the sequel." In a recent interview Ruth shared her story. "I have been writing since I learned my ABCs, but never considered anyone would publish my efforts until financial desperation forced my hand in 1962. To my amazement, The Family Herald and Weekly Star (long since deceased) published my first submission on raising geese and asked for more contributions. Since then some 350 articles and essays have appeared in US and Canadian magazines and I regret I didn't recognize the potential earlier. My first attempt at a novel was spawned by my love of pioneer history. I'd read many books on the settlement of Eastern Ontario and the Maritimes. I could find none set in the Niagara Peninsula. Why not? After all, that was the birthplace of Ontario. Dramatic possibilities, not only in a settler-family's harrowing experience carving a home from the forest, but in the establishment of a province with the accompanying pageantry. Great material.To my dismay, I found fiction required a complete change of technique. In nonfiction, one uses the old saw re sermons: 'Tell them what you are going to tell them, tell them, then tell them what you told them'. Fiction is the opposite. Every piece of fiction I write, even now, has to be vetted to remove the sentence at the beginning of paragraphs that reveals what the paragraph will be about. Topic sentences completely destroy the tension required to keep the reader turning pages. Like most first-time authors, I thought my first novel, Flight to the Frontier, was perfect and eagerly queried agents then, undaunted, publishers. Disillusioned by the printed slips of paper received in return, I put my masterpiece away but continued to write short pieces and study the craft. Whenever I discovered a new technique I hauled out the manuscript, revised, and sent it out again. Local critique groups, The Internet Writing Workshop. and NovelAdvice (sadly no longer on line) were a great help in pointing out repetitive words--the bane of my life-- as well as holes in the plot. Recently I learned that verbs like, saw, knew, and felt, distance the reader from the POV character and should be eliminated wherever possible. Amazing the difference it makes. My former fly-on-the-wall approach was much too stilted and formal. Finally, success. Chronicler Publishing, a royalty-paying POD publisher in Edmonton, Alberta, Canada, published Flight to the Frontier, just in time for my 91st birthday. The book is available in paperback from Amazon and Barnes and Noble. Mr. Goulet, the Editor/Publisher, handles only Canadian historical fiction. He has been open to my suggestions, both as to the text and cover, and I'm happy to say is now considering the sequel, Niagara Odyssey. I live in London, Ontario with a contrary cat and an equally contrary computer, and keep busy revising the third volume of the trilogy, Canadian Mosaic--when the computer cooperates. The moral of the story: If you are a real writer you have to keep feeding your addiction. And somewhere there is an editor/publisher who will share your dream when you have polished the manuscript sufficiently. However, if you have to force yourself to write, forget it. Grow flowers or knit afghans. No one in their right mind should endure the discouragement writers face if they can possibly help themselves." Other works Ruth has published include a novel, High on Grass, a short article, “Have Tulip Will Travel” published In GreenPrints (Print mag) www.greenprints.com, a short story “A Bird in the Hand” published online CommuterLit, and “Hello Central” at www.commuterlit.com. Her “A Cinnamon Scented Grandmother” has been chosen for inclusion in an anthology on grandmothers. 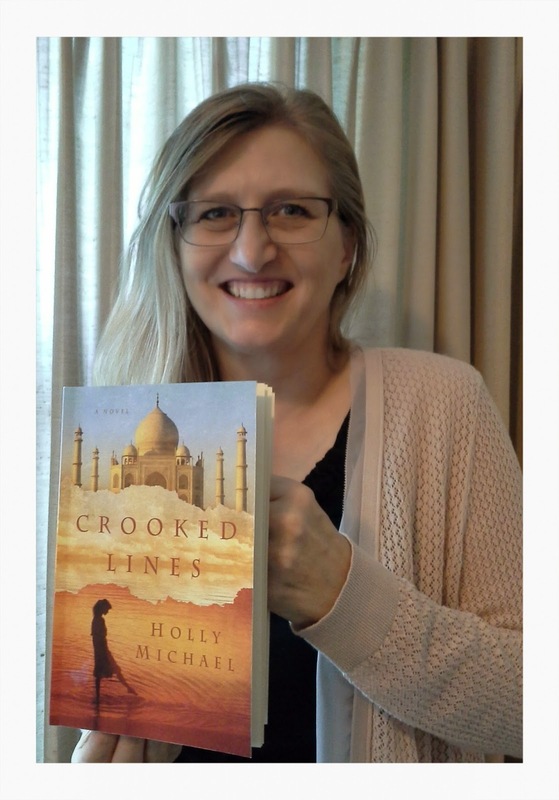 Holly Michael's debut novel, Crooked Lines, was released July 20, 2014 by AMDG Publishing and is available on Amazon in Kindle and paperback. On the shores of Lake Michigan, Rebecca Meyer seeks escape. Guilt-ridden over her little sister's death, she sets her heart on India, a symbol of peace. Across the ocean in South India, Sagai Raj leaves his tranquil hill station home and impoverished family to answer a higher calling. Pushing through diverse cultural and religious milieus, he labors toward his goals, while wrong turns and bad choices block Rebecca from hers. Traveling similar paths and bridged across oceans through a priest, the two desire peace and their divine destiny. But vows and blind obedience at all costs must be weighed…And buried memories, unearthed. Meet Holly Michael ~ a long standing member of Internet Writing Workshop. You won't want to miss her debut novel.